Also see open source CRM software reviews. 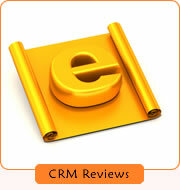 Our CRM software reviews are based on first hand assessments and the input of colleagues and visitors to this website. While they may not be statistically accurate when compared to the entire industry at large, the candid feedback and relevant comments seem to be appreciated by countless participants and readers. We enjoy hearing all opinions from a diverse group. If you have first hand experience with any of the on demand CRM software systems referenced on this site, please feel free to send your input and comments to info[at]crmforecast[dot]com. We appreciate all contributions. Please also reference this web site's terms for additional information. In an on-demand customer relationship management software market research report, Forrester Research found the use of hosted software products in companies with more than 1,000 employees grew 33%. The survey among 1,017 information technology (IT) professionals also identified the most popular hosted software applications to be CRM software, human resources software and collaboration tools.